CNEWA - It's finally here! 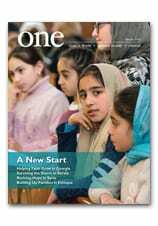 Important stories and vibrant photography mark the newest issue of ONE — coming soon to a mailbox near you! OK folks, so it took a little while longer for the editorial staff to churn out this latest edition of the magazine. We hope you agree that our new and improved look in print was worth the wait. Yep, the trim size of our print edition is larger, the type is larger, the graphics are enhanced and we have made it easier to connect the story to what CNEWA does and how you can help. Great — there’s more online with additional interviews, slide shows, short films and other multimedia features. But for just $24 a year, you can receive our quarterly in glorious color. As part of the evolution of ONE magazine, we are also in the planning stages of enhancing our digital edition, as well as the entire web site. Stay tuned! And tell us how you feel about the new look! Michael La Civita is CNEWA’s chief communications officer.